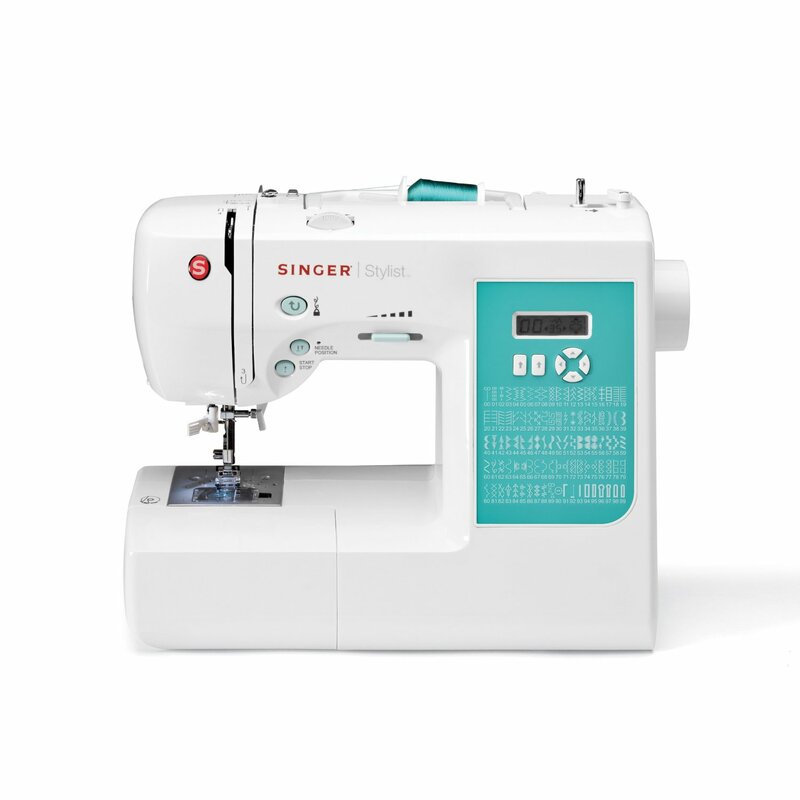 Singer 7258 Stylist is synonymous for all types of sewing which has been designed with the spirit of practical design and creative innovation. This product was introduced by Singer recently which is the leader in developing products for every level of sewing. Singer is the company which is dedicated for helping people to express themselves through the act of sewing. The singer sewing machine comes with almost 100 stitching patterns along with seven fully automatic one-step buttonholes. The set-up of the singer sewing machine will be a breeze which has a horizontal thread delivery and automatic needle threader. The system is constructed with a top loading bobbin system which is incorporating the magnet-type vertical axis rotating hook. In contrast with Brother CS6000i, which contains LCD display screen the current one comes with the most improvised LED display screen. There is push-button stitch selection with which you can select the desired stitch with push of a button. This machine also comes with the sewing’s biggest timesaver function, which is automatic needle threader. There is an automatic tension which would ensure excellent stitch quality. The stylist comes with the rigid internal skeleton which provides it with maximum durability. Push-Button: The push-button stitch selection will allow you to easily select the desired stitch with a simple push of a button. There are some optimum settings for length and width which would have been set automatically. Programmable Needle: You have the option to select whether the needle should be up or down when the machine stops in order for easier quilting. LED Display: This lamp would illuminate the surface of sewing which provides you with optimal viewing. This long-lasting bulb would stay cool, no matter, how long you are operating the machine. Speed Control: To your surprise, this sewing machine model could operate without the use of foot controller. The electronic speed control feature will let you to gain complete control over the speed. There is also start/stop button. Automatic Tension: This system would make sure of achieving an excellent stitch quality, no matter, whatever fabric you are sewing. Presser Foot: There is a snap-on presser foot would allow to change from one to another effortlessly. You will require no screwdrivers for the purpose of changing the feet. The Stylist sewing machine has been constructed with some extra-ordinary features which were responsible to make this machine as an excellent sewing machine of current times. Built-in Stitches: The stylist sewing machine comes with as many as 100 built-in stitches, so that, you will have the right stitch for each and every project. This includes nine essential, eight stretch and 76 decorative stitches. Bobbin System: This sewing machine comes with jam-proof and top loading bobbin system which ensures a smooth and quiet sewing. With this mechanism, it will be easier to insert the bobbin. There is a clear cover which will make it convenient for you to monitor the supply of bobbin thread. Bobbin Winding: The singer stylist comes with an automated bobbin winding system. You will have to just follow the numbered diagram that is printed on the machine for winding. Also, the needle bar would automatically disengage during the bobbin winding. This makes winding safer. Free Arm Storage: You can avail the on-board storage of accessories with the free arm storage area. This would mean that the accessories are always handy. This machine can be operated with much ease by using the in-built stitches and 10 presser feet at the first step. The automated needle threader makes the threading easier. In addition, there is an electronic auto pilot which would allow you to sew without any foot pedal and you can easily adjust the speed. There is an auto tie-off function which can tie-off the straight stitches with push of a button. There is an automatic reverse button for you at the convenient place which will sew the stitches in reverse by just pushing. With the help of the programmable needle up/down, you can program the needle to stop in the highest position, thereby; you can remove the fabric with much ease. The sewing machine reviews that the Singer Stylist machine has several advantages over other similar products in the market which makes it to stand out in the competitive market. You can use the auto tie-off function for decorative stitches as well. With maximum speed of 750 stitches per minute, you can sew very quickly. In this machine, the amount of pressure exerted by the presser foot is automatic. The presser foot lifter has been provided with two heights and offers more clearance. The Stylist machine has a center zigzag taper for tapering the stitch to the center. This has other advantages like twin need capability, 13 needle positions, optimum power control and six segment feeding system. This includes 10 presser feet which provides tools for all your sewing and quilting needs. The package also comes with a number of accessories used for various purposes and DVD which contains tutorials about operation. The presser foot cannot be adjusted as it is automatic and the stitch width has been limited to 5 mm. With lots of amazing features, this easy-to-use Singer 7258 Stylist sewing machine will be your best buy for this season. You can make the best use of this machine for various kinds of sewing like fashion sewing, quilting, decorative sewing and much more. This fully computerized machine will turn to be your true fashion mate in all means.